I’ve had 2 cycles of inexplicable breakouts in the past few months that stunned me primarily because I had gotten my skin to a level where I was very happy with how it looked, and it had been relatively breakout free for a while. I also was not trialing any new products, relatively speaking and hormones had been ruled out. So suddenly experiencing crazy bouts of acne on the lower half of my face that would not subside despite all ministrations, was bugging me. I’d changed my skincare, started using anti-acne skincare, changed my sheets, gone for facials to no avail. Naturally, when you get stressed, things get worse. So one day, I sat back and thought about things. Perhaps it was not product related. Perhaps it was internal. The weather had been very hot, perhaps I had not been drinking sufficient water to flush out toxins. Perhaps I had not been eating enough fruits and vegetables. Perhaps it was constipation and a digestive problem. So I took stock of the situation and did a bit of a lifestyle change. 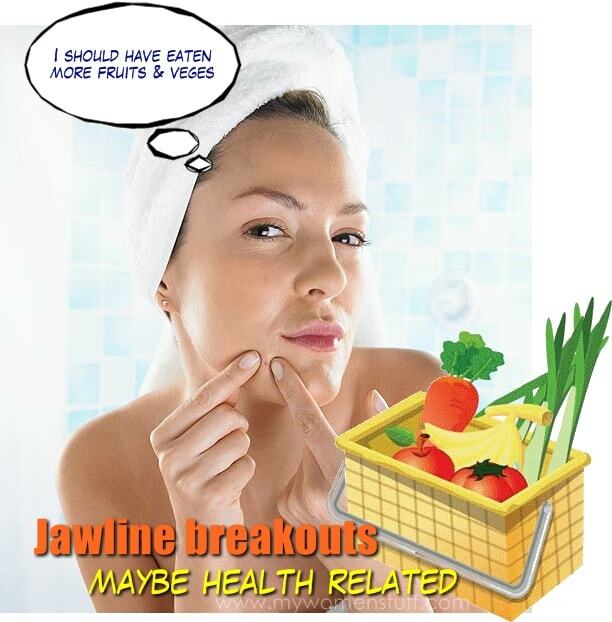 What prompted this thought was when I decided to look up possible causes of acne around the chin, mouth and jawline area. It turned up information on various websites that said it might be either hormonal or linked to the digestive tract. Poor digestion might result in chin and jaw acne, as well as possibly constipation. I latched onto that thought, because I was having a bit of a problem there. Also, eating out a lot means not eating enough fruits and vegetables so I wasn’t getting a lot of fibre. To solve this problem, I started eating out less, and when I did, made sure that I had a healthy amount of vegetables included in every meal. I also made sure my house was stocked with fruits. I’d go to the local market once a week and stock up on both fruits and vegetables, where they are cheaper and fresher than buying in the supermarkets. I’d make sure to eat them too. I also made sure I had enough water throughout the day. More than the regulation 8 glasses because the weather here has been baking hot. Another thing I did was to cut out dairy almost totally from my diet, as well as go on a low gluten diet. I realised that dairy products gave me digestive problems which led me to believe that in my dotage, I’ve developed lactose intolerancy. No more cheesecake, cheesy pizza and ice-cream! 😛 I also cut back on foods like breads and cakes and started a diet of breakfast oats in the morning. The results were two-fold. Firstly, I became more regular (whew!) and secondly, I started seeing benefits for my skin. It took a little while for the acne spots to go away, but new ones stopped sprouting. Over the course of about 2 weeks, my chin and jawline area cleared up from the worst of the breakouts. Going on a purely hydrating skincare regiment helped clear up the rest and deal with the marks. This little experience taught me that while sometimes, I might break out from using a new product, not every breakout may be caused by topical contact. Sometimes, it is a sign that something is wrong internally and that you should check your internal plumbing for blockages. Sometimes, it might be certain foods that cause you problems or a health problem. Have you thought about this before? Have you had a similar experience as I did, and did a lifestyle change help you clear up your acne and breakouts? This tip is based on my personal experience and observation. I am not medically trained and am not a nutritionist. If in doubt, consult your doctor. NEXT POST: Oyez! Oyez! Oyez! I am a Judge and Beauty Court is in session! sigh, this is a great idea. unfortunately, i usually break out on my cheeks. not forehead, never chin, no more jawline, no nose. and the funny thing is, its only my right cheek, only. but i agree its a great thing to do, eat lots of fruits and drink lots of water, i am going to try that! plus, alot of ppl i know do break out from lactose. but i cannot live without my cheese. and chocolate. having same prob here – acne on R cheek. I normally got acne on the chin (hormone) or eye brows (stress), never on the cheek. But for the past 2 mths, 1 acne popped out b4 my period, and b4 the mark went down, another one came to join the party this month. Am having mixed feelings : 1)kinda happy coz my period was never ever on-time, and 2) frust lo, coz nobody likes acne on their face ma… right ? Hey, that could be caused by many things but the first thing that comes to my mind: When you talk on the phone, is it on the right side? Could be that you need to clean your phone. I washed my pillow cases with Dettol! It helps to reduce cheeks outbreaks! I don’t eat enough fruits and vegetables too. Will definitely eat more to see if it cleans rest of my acne. Its great that you know what causes your breakouts, Patty 🙂 At least you’ll know how to get rid of the problem and yes, sleeping early is always beneficial not only for beauty but for health too! Yay!! So happy that you like the brush too 😀 It makes applying foundation a breeze right? As for myself, I’m a strange breed. I am not into chocolate! I know right? So random LOL! I’ve been experiencing dry, ezcema like patches on both my cheeks. Worse still it leaves dark patches on my cheeks. I’ve been doing mask constantly, eat well – have homecooked food at my mom’s from Mondays to Fridays, lots of fruits and vegetables, drink lots of water….. I’m at my wit’s end, don’t know what to do next. Any suggestions ??? Please help !!!! Did you try Evening Primrose Oil? It sorta works though. Sorry but this is totally out of the acne topic but I once consumed Evening Primrose Oil for about 2 huge bottles (maybe 2 months) coz I read somewhere that it somehow will get rid of PMS cramps but to no avail. Instead, my scalp + facial skin excretes 2x the oiliness that I usually get! To the fact that I had to wash my hair twice a day!! Gosh, I’m not sure what that could be Mei Ping. Have you tried seeing a dermatologist? Sometimes it could be eczema or an allergy – we never know just what might trigger it. I hope you find the cause and solution soon! That’s a good tip – what’s your detox regiment like? I hope this will help you! I know just how frustrating it can be to keep breaking out and not find a solution. Sometimes, products can’t help at all! It could also be sweat, pollution or heat (Its been very hot lately) but food definitely plays a part. Do try cutting back on oily fast food, and eat more fruits and veggies. As a result, the bowels are heh heh, quite regular. As for breakouts, well, I get the odd pimple here and there every once in a while. Lots of water (with lots of ice) for me works too! Thank you! I’m hoping the same – suddenly having a breakout for no reason was so traumatizing LOL! As for stress being a factor, I found that stress would break me out on other parts of the face – forehead mostly. Maybe its all that brainwork hehe… But I do think overall, a nice healthy diet will definitely help on an overall basis. I’ve been taking fish oil recently too! Not sure if its helping my skin but well, so long as it does not do any harm, why not eh? I hope the magic water saves you too! I do agree with you and good to see something like this in a beauty blog! Also to consider that acne just above the eyebrows could mean your liver is not working well which is also diet related. I read that gluten-sensitive folks could be overworking their livers if consuming too much baked goods, pasta etc. I feel that if I do not eat enough veggies and fruit, I would also break out easily. And dairy is def a culprit…But it’s so hard to say no to cheese and pasta and bread…! I try to eat them only once or twice a week. Glad to know you were able to get rid of your bout of acne – well done! Exercise is great too and definitely aids skin to look better – plus it feels nice too right? 😀 I did consider hormones but it didn’t tie in. But generally yeah, hormones will definitely contribute to chin acne. Ah breakouts! I have them prior to monthly period or if I’m stressed and tired! You’re right, it could be the quality of food that I eat too! I used to get monthly spots too thanks to those darned hormones! But I haven’t had them for a while hence the sudden panic LOL! You know what’s funny, Gin, whenever I fall sick, I actually end up with really nice skin. So weird right?! Especially when I have a fever. Its like it burns away the bacteria LOL!! But yes, monthly hormones definitely contribute to skin problems. I guess I”m lucky in that I haven’t had those for a while. I found that when I was taking evening primrose oil for a while, it helped. I didn’t get cramps and no hormonal acne either. Have you tried that? i have severe menstrual cramps and i tried evening primroses but it didnt help… now it is time to experiment it for my skin!!! Yes, the area of breakout shows what it’s related to. =) Hmmm, but I hurt that breakout at the temples is more due to indigestion. And strangely, breakout on the forehead is due to stress! haha, quite logical. Yes! I did notice that during high stress periods, my forehead would break out. Quite logically I thought, with all that mental work going on LOL! This is very much in tune with my recent post. I tried a healthy diet last year to cure my sudden and very bad acne breakout and the diet shift definitely paid off. It was a drastic improvement. But I guess I got complacent and lazy so for the last 2 months, I went back to my old unhealthy, meaty, sugary, creamy and whatnot-y diet and suddenly started having pimples and uneven skin tone again, not to mention, I had two rounds of flu in 2 months! Glad to know a similar lifestyle shift helped you too Vivi. I too find that when I fall off the bandwagon, my skin does tend to suffer a little but since I also realized that a lot of foods I decided to cut out of my diet also made me feel uncomfortable after eating, it wasn’t too hard to then just stop eating them so I wouldn’t suffer 😀 But its hard, I will agree if you also enjoy eating the same foods that can wreak havoc on your skin 🙂 Hope you’re feeling better! i have been battling adult acne for the past 1 year and most of them popped up on my cheeks. now the acne on the cheeks have cleared and now their new location is the chin area. i believe drinking water and green tea helps to clear the spots. now i am quite happy with the condition of my skin, just gotta tackle the marks it left behind! will hydration help with the marks?